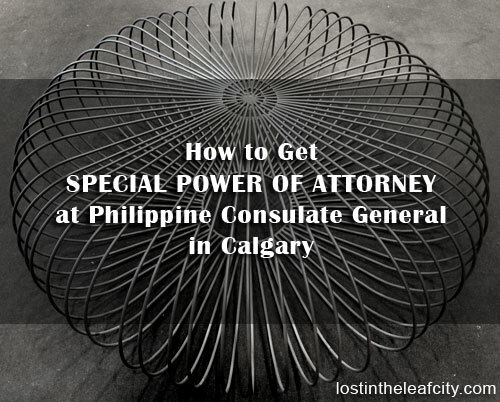 For the first time I have to get a special power of attorney at Philippine Consulate General in Calgary. The trip went well with the help of a reader who shared a lot of tips which I’m going to write in details on this post. So pay attention on how to immediately accomplish this task and save a lot. Experience is definitely the greatest teacher. I’ve also added a free event you probably haven’t heard of till now. You wouldn’t want to miss it. But let’s focus on business first before any side trip. Isn’t it great to gather only few requirements. But I do have a hard time thinking of what I should write about the responsibilities of the authorized person. I cannot find any example in writing the scopes and limitations. What to do then? Think of the purpose of the special power of attorney. What are the tasks that you, as a principal, will entrust to the authorized person. Once you figure it out, let’s move on to the process of getting an SPA. I have to update the post because I often get the same question so I’m answering it before you go through the steps of getting an SPA. Otherwise, you can get an SPA and have it notarized then authenticate the document in the Embassy or Consulate through personal appearance or mail. Authentication also means consularization. The document has a seal and red ribbon. Either way, notary public and authentication is mandatory for a document to serve its legal purpose in the Philippines. Step #1: Complete all the requirements (refer above). If you need to photocopy the documents, the Consulate has a self-service xerox machine for $1.00 per page. It’s a bit pricey but convenient for someone who doesn’t have to go anywhere else. THE SHOP IS NOW CLOSED. Go to the Rocky Mountain Plaza across the City Hall Station in downtown Calgary. In this same building, I applied for a US non-immigrant visa at the US Embassy many years ago. By the entrance of the building, you can go to a shop and photo copy the documents for as low as $0.25 (black and white) per page. Visit any Calgary Public Library if you are a member. Printing is free (maximum of $5.00 per month). The Central Library is the closest library to the Consulate. The computers and xerox machines are in the 3rd floor. What alternative did I chose? I had lunch at Tim Hortons and paid in cash so I can have a change for the photocopy in the Rocky Mountain Plaza. 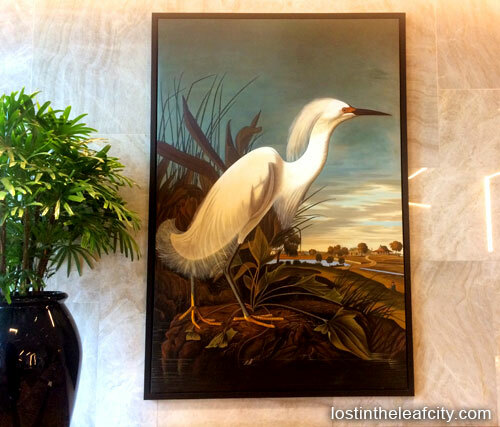 Lobby at the Centre 10 Building. Step #2: Go to the Philippine Consulate General in Calgary. It wouldn’t matter to figure out when is the best time to go unless you book an appointment to renew the Philippine passport. Any time is the best time. I observed that everyone is comfortable and patiently waiting for their turn. The staff and the process are organized although the office is small, yet big enough to accommodate the applicants and their companies (the families are in full support). Step #3: Submit the requirements. I was fortunate to learn some tips from a reader and I’ll share it to you as well. After glancing how busy the officers were, I approached a staff who were available. Next thing I know, I was sitting on the chair waiting for another officer to assist me while the other applicants mostly for passport renewal were waiting in line behind me. The officer asked me what is the purpose of the SPA; well, that would be between us. I’m sure you can come up with your own reason. Or you maybe not ask at all. Step #4: Claim the special power of attorney. Claim the SPA at the Consulate. Request the SPA to be mailed to your address for a fee. Guess which method I chose? Although a reader told me that he bought a mailing envelope for $20.00 so he can expects his SPA to arrive through mail, I chose to go back to the Consulate after three working days. Well that was a productive day and I didn’t spend much at all. By the way, the movie was great. I wouldn’t miss the next show. So there you have it. I hope you do better in saving to get a special power of attorney at the Philippine Consulate General in Calgary. If you are considering another way to get an SPA or have a story to tell, don’t forget to leave a comment. « Penalty In Renewing Philippine Passport With Less Than 6-Month Validity? I’ll only have my husband with me when I go to the consulate to have the S.P.A. notarize, but the form requires two witnesses. Can we just get anyone at the consulate to be a witness, like for example other people there who also getting documents notarized? I didn’t put any witnesses either and everything went well. Hello there. Thanks for your infos, need ba na back to back un photocopy ng ID? Thanks! Glad to be of help. To be sure better have a photocopy of the front and back of an ID. “So this is what it feels likes to become a VIP, bypassing the queue and not looking behind to see envious eyes.” That’s not very Canadian. That’s very Filipino 🙂 Overall, it’s excellent log and helpful.